(L) A young Hon. George Cadle Price visiting the country side; one of a kind. This is a picture of my grand-uncle Elias Crawford (3rd from the left) with the Rt. Hon. George Cadle Price in Back Landing Village sometime in the late 1960’s. Back Landing was a village in the Orange Walk District inhabited mostly by the Crawford and Rhaburn families. 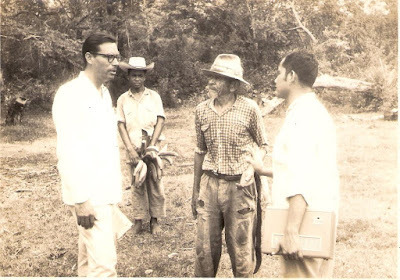 In the late 1960’s most of the people abandoned the village for Carmelita Village near by, and Esparanza Village in the Cayo District. My grand uncle died when I was about 8 years old and I remember walking from Crooked Tree Village via the New River Pine Ridge with my parents and other relatives to attend the funeral. When we arrived he was already dressed and was laid out on his bed waiting for the coffin to be finished. My dad took me to the room to see him and being a little child, I got to the room door and seeing from his waist down, I became very scared and bolted for outside, crying. All I could remember was seeing his feet in white socks. A few weeks ago I received this picture from one of the Crawford’s in Esparanza Village, Belize and I must say, that this is the first time I’m seeing the face of Uncle Elias Crawford. And looking at it, I can see a strong resemblance to my father, Winston Crawford. Linda, thank you so much for the story of this picture with my grandfather. He was a man of honor, intelligent but firm. He was the best!! Linda....very nice article and great memories for you and your family. HI Linda, thanks for the picture, yes I looked at this picture a few times when I stayed with Alma a few weeks ago and she was telling me the stories. How precious pictures can be to bring back vivid memories. Linda, I need to let you know that I really appreciate and admire your absolute sense of family. A true virtue. Very nice memories Linda and cool picture. Wish I could have met him.